Gethsemane became one of the first places of the Holy Land to be visited by modern Russian pilgrims. From the tomb of the Most Blessed Virgin Mary people walk up a narrow, steep street. After visiting a Franciscan monastery, where old olive trees of the Garden of Gethsemane that were witnesses of the life of Christ on the earth still grow, Orthodox pilgrims come up to the gate of the “Russian Gethsemane”. It is here that the holy relics of Grand Duchess Elisabeth the New Martyr and her cell-attendant Nun-Martyr Barbara have rested at the Church of St. Mary Magdalene, built in the 1880s by the imperial family in honor of the Russian Empress Consort Mary Alexandrovna (1824-1880). First of all, Russian believers with come great zeal to venerate the relics of the holy new martyrs. At the temple they hear ascetic chanting according to the Typikon, which has largely retained the pre-revolutionary traditions of monastic choirs. An amicable and peaceful atmosphere reigns in the “Russian Gethsemane”. The convent’s nuns show pilgrims the stone on which, according to tradition, Apostle Thomas found the Holy Cincture of the Mother of God. 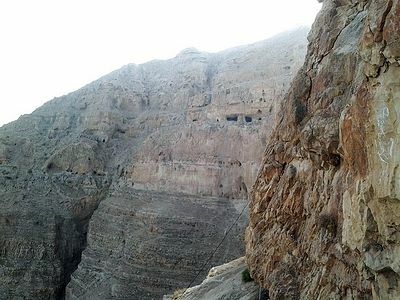 Together with their guests they proceed to visit the cave church dedicated to the icon, “The Prayer for the Chalice”, then lead pilgrims to the ancient Biblical flight of steps from which the Lord is believed to have entered Jerusalem. They tell the visitors about the convent’s cemetery, which became the resting-place of many nuns and Russian emigrants, one of whom is Mikhail Khripunov, the last Flugel-Adjutant of Tsar-Martyr Nicholas II. The community of Bethany and Gethsemane was founded in 1933 with the blessing of Metropolitan Anastasius (Gribanovsky; 1873-1965), the future second First Hierarch of the Russian Orthodox Church Outside of Russia. Before the October Revolution, between 1906 and 1914, he had been Abbot of the St. Daniel’s Monastery in Moscow. Divided by the tragedy of 1917, the Russian Orthodox people strove to preserve their faith despite everything—both in the Soviet Russia and abroad. Finding themselves in the Russian diaspora and in an unfamiliar religious environment, most Russian people nevertheless preached Orthodoxy by their own lives. In 1929, novice-nun Valentina (Tsvetkova) from an intelligent Moscow family was put in charge of the Russian plot of land in Gethsemane by Metropolitan Anastasius. It was here that in 1933 two Anglican nuns, Stella Robinson and Alexandra (“Alix”) Sprot, stopped during their stay in the Holy Land. They then did not know anything about Russia or Orthodoxy. Once Sister Valentina (whose confessors were the holy elder Aristokly of Mt. 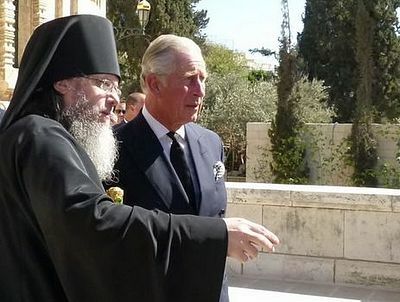 Athos and Moscow, the holy elder Anatoly [Potapov] of Optina, and spiritual father, Bishop-Martyr Arseny [Zhadanovsky] of Moscow) talked with the Anglican nuns about Russia for a long time, sharing the memories of her personal communication with the holy Grand Duchess Elisabeth Feodorovna with them. Notably, she told them that when St. Elisabeth had first seen her as a girl she [the saint] exclaimed: “Valentina will be my follower”. Nun Stella had a booklet on Grand Duchess Elisabeth Feodorovna that she had bought just before her departure from Britain. When both nuns learned that the remains of the new martyr reposed under the Church of St. Mary Magdalene, they began to attend services in there. The life and martyrdom of Elisabeth the New Martyr inspired the Anglican sisters and led to their inner spiritual transformation; as a result, they decided to embrace Orthodoxy and become Orthodox nuns. This they did in 1934. Two years later, Sister Stella, who had been tonsured a nun with the name Mary, was appointed abbess of the community of Bethany and Gethsemane. Using donations from her relatives, Abbess Mary built a boarding school for Orthodox girls from Arab and Russian families in Bethany, opened an icon-painting school along with a weaving workshop for blind young women, and an outpatient clinic for the local population. Olga Aleyeva, a graduate of Smolny Institute [in St. Petersburg; before the Revolution, Petrograd], became the boarding-school’s headmistress. Sister Olga, an experienced educator and niece of Professor Mechnikov, assisted her with the children’s education. The English Orthodox missionary Archimandrite Lazarus (Moore; 1902-1992), who had come from India to Jerusalem for this purpose, taught English there. At first the community gathered by Abbess Mary was multinational. Palestinian girls, Russian emigrants, and nuns from Europe initially prayed and worked there. This convent produced such prominent abbesses as Mother Tamara (secular name: Princess Tatiana Constantinovna; 1890-1979), a daughter of Grand Duke Constantine Constantinovich Romanov who also was a well-known poet. She became Abbess of the Mount of Olives Convent in Jerusalem. Nuns of the convent of Bethany also established Orthodox monastic communities in London, and even as far away as Chile. Thanks to her meekness, self-sacrificing service to her neighbors, and affection for all—Christians and non-Christians alike—Abbess Mary won the hearts and respect of all who ever met her. Archimandrite Dimitry, who worked in the Holy Land at that time, delivered the following oration during the funeral of Abbess Mary on October 26 (according to the old calendar), 1969: Leaving all—her homeland, relatives, and material well-being, she joined us on Russian Golgotha with courage, sharing the Russian people’s sorrows and suffering. She became abbess of these Russian convents not in the days of our motherland’s glory and prosperity, but in the period when the Russian Church, persecuted and almost bleeding to death, was being crucified on the cross… Can we forget all of this? No! This is the answer of the present-day Gethsemane nuns and all those who come to work at the convent of Gethsemane from Russia and many other countries throughout the world—the pious pilgrims who find here the spirit of love, inner freedom and courteous manners—the qualities that are so characteristic of the “Russian Gethsemane”. The traditions introduced by Abbess Mary are still alive today. This can be seen in the life of the monastic community, which is multinational in composition yet united in spirit, and which adopted and absorbed the monastic traditions of old Russia. The most important of them is the example of the Sts. Martha and Mary Convent of Mercy, founded by the Holy Grand Duchess Elisabeth Feodorovna in Moscow. The example of holiness of the Bethany maidens and servants of Christ, Martha and Mary, is the basis of monastic life of the sisters in “Russian Gethsemane”. As before, they are doing their best to uphold the precept that Archbishop (later Metropolitan) Anastasius once gave to the first nuns of the convent: The sisters of Gethsemane should develop inward spiritual activity, like Mary [Martha’s sister from the Gospel – ed]. And the sisters of Bethany should serve their neighbors. It always comes as a surprise to learn that the founding abbess of one of the most revered convents of the Russian diaspora and of the Holy Land was a convert, a Scotswoman who began life as Barbara Robinson. Her life and spiritual character bear evident resemblance to that of another convert, the Grand Duchess Elizabeth, who became her guiding star. They had been at Gethsemane a few weeks, still with the intention of continuing on to India, when one night Sr. Stella had a dream. A woman dressed in a beautiful habit, with strikingly beautiful eyes, came to her and said, “You cannot leave. Your place is here in Jerusalem.” When the next day Sister Stella related this dream to Sister Valentina, the latter fetched a photograph of Grand Duchess Elizabeth, whom Sister Stella at once recognized to be the woman in her dream. It was, she later noted, the inspiration of Grand Duchess Elizabeth, herself a convert of part English ancestry, that sealed her decision to become Orthodox. Sister Alix followed her example. Metropolitan Anastassy himself guided their catechesis, and on September 5,1933, they were received into the saving fold of Holy Orthodoxy. Sister Stella received the name Mary, in honor of St Mary Magdalene, and Sister Alix became Martha. It was evident to Metropolitan Anastassy that this aristocratic-looking Scotswoman was a very capable individual. With his blessing, a sisterhood was founded and a temporary chapel was set up on the Russian mission property in Bethany. Mary, assisted by her companion Martha, worked tirelessly to rescue the property and its buildings from their dilapidated state. She had a gift for attracting benefactors and, through the influence of her family, was able to enlist the aid of the British Bible Society. Martha came from a very well-endowed family, and they, too, contributed significantly. Buildings were restored, the cistern was repaired, the garden was cleared and cultivated, a clinic was opened. Meanwhile, with the blessing of Metropolitan Anastassy, Mary began gathering sisters for a future monastic community at Gethsemane In 1933 she was placed in charge of the Russian Garden of Gethsemane and its church of St Mary Magdalene Martha was appointed to be her assistant and given charge of the Bethany property. “You came to us from a different people and from a different religious community, in every nation, however, there are those who fear the Lord. In every Christian country there are people on whom He places His seal at birth and leads them to Himself by means of paths unknown to man. Everywhere there are the chosen ones who have heard God’s call from childhood just as Samuel did. You were one of these. The voice calling from heaven touched your heart very early, and afterwards not all the noise of life’s bustle nor all the songs of the earth could silence it. “At times, according to your own testimony, an element of gloom rushed upon you, ready to swallow you, but you had a lamp which shone brightly in your soul and darkness did not envelope it. You had already come to love the Heavenly Bridegroom with all your heart. Because of Him, you refused all the delights of youth and entered one of the monastic communities in order to dedicate yourself later to self-denying missionary service in India. “Nevertheless, an inner voice told you that the first and basic aim of a Christian must be to know the truth, that is, to learn the pure, undefiled Christian teaching and to join yourself to the fulness of an abundant Church life. “Not finding either of these in the community to which you then belonged, you hoped to fill the deficiency in Anglo-Catholicism, that is, in that branch of the Anglican Confession which most nearly approaches the Orthodox Church. In fact, the motivating force that brought forth the great Oxford Movement a hundred years ago, the continuation of which is today’s Anglo-Catholicism, was the desire on the part of the most fervent Anglicans to re-establish the lost bond with the ancient, One, Universal Church, the living memory of which never died in the bosom of Anglicanism. The Eastern Orthodox Church possesses the advantage over the other Christian confessions in that it never broke this organic unity with the ancient Apostolic Church, remaining faithful to its spirit in all things. This has given it the strength to preserve in itself the complete fulness of truth and grace which was given to His Church by its Divine founder, Christ. You saw this with your own penetrating gaze immediately upon coming closer to Orthodoxy, and your heart automatically [involuntarily] reached out for it. “Even before coming into contact with Orthodoxy, you already clearly felt monasticism to be the highest embodiment of the Christian ideal. You had already entered the path of monastic podvig. Orthodox teachings deepened for you the thought of monasticism itself, and the Orthodox Church now gives you a special grace for the worthy fulfillment of this genuinely super-human way of life, a way of life that is more heavenly than earthly. “In the brilliance et Mount Tabor, which will always illuminate for you the day of your complete betrothal to Christ,, the lofty significance of monasticism is revealed with special clarity. What is the essence of monasticism if not a constant ascent to the mountain of the Lord and entry into the glory of the sons of God. From the crucible of prayer to which the God-man gave Himself on Tabor, the wondrous mystery of His Transfiguration emerged and shone forth. Sister Valentina was also professed at that time and became Mother Barbara. In 1935 Mother Mary was appointed superior of the women’s convent of the Resurrection of Christ in Bethany. The following year she visited Belgrade, where she was raised to the rank of abbess by His Eminence Metropolitan Anthony (Khrapovitsky), and given a jeweled pectoral cross belonging to Metropolitan Anastassy. At the time of their tonsure, Metroplitan Anastassy said to the nuns, “I entrust Bethany to you; we need to start a school there.” With God’s help the nuns organized an elementary school for girls, which officially opened with a special service of blessing on Lazarus Saturday, 1937. That same year the house-chapel was frescoed by a new sister, an iconegrapher, whose talents inspired the opening of an icon studio there in Bethany. The next year the school expanded and received British accredation as an academy. It soon acquired a superior reputation, and its enrollment increased to more than a hundred Orthodox-Arab girl boarders. In addition to the usual curriculum, the girls learned Arabic, Russian and English. They were also schooled in Orthodox piety, and some of the pupils later became monastics. Mother Mary took an active part in the school administration, and visited it almost daily, frequently making the two-mile trip from Jerusalem and back on a donkey. With the outbreak of World War II in 1939, communication with Metropolitan Anastassy, then in Munich, was suspended; it was later restored thanks to Mother Mary’s persistent inquiries at the Red Cross. Meanwhile, hundreds of Russian soldiers, held up in Palestine on their way to Italy, joined the nuns for prayer in the church of St Mary Magdalene. In Palestine, however, the horrific realities of war came later, with the departure of the British in 1948. Simmering tensions between Arabs and Israelis exploded in bitter fighting in and around Jerusalem. As a British subject, Abbess Mary could have returned to the safety of her homeland, but she declined to abandon her sisters and her children of the Bethany School. Her energies and her talents were dedicated, as always, to helping those in need. She turned the school into a hospital, the classrooms became wards. A courageous young doctor offered his service, s, and he was joined by a number of professional nurses, who in turn were assisted by the nuns and the older girls at the school. Every day brought more wounded, soldiers and civilians. Bread and other provisions were often obtained under artillery fire. Death and destruction were all around. Fortunately, Mother Mary managed to secure for the hospital the protection of the Red Cross, its flag flying over the walls of the community made Bethany a relatively safe haven. During the worst shelling, local Palestinians sought shelter there, spending the night in the cave on the property, together with their domesticated animals. Somehow the school continued to function, with pupils coming even from other schools. There was no disruption in the order of services, and the intensified prayer of the nuns drew upon them the evident power of God’s mercy. There was a particularly tense period in the winter of 1949, when the military High Command declared its plans to requisition all the buildings of the Bethany School, due to its strategic location, and to evict the entire community. The nuns began removing furnishings and other items to Gethsemane, some things they stored in the cave, a place in the country was rented to house some of the children and elderly. The sisters prayed fervently, and -- a miracle. At someone’s chance suggestion, a letter was sent by courier to Amman, to general Glob Pasha, and on the very Feast of Nativity, at trapeza after Liturgy, a reply was received: the order for the requisition had been given in error. Glory to God! Throughout these years of difficulty and uncertainty, Abbess Mary was a model of evangelical self sacrifice, inspiring those around her with her courage and energy, consoling the grieving and fainthearted... She was, in a word, a noble example of unfailing and selfless charity, which lies at the heart of true Christianity. With the end of the war, the Bethany community began functioning more normally, and dozens of schoolgirls once again ran about in the courtyard. The war, however, had left its mark, and among its causalities were a number of blind girls. The community decided to help them by teaching them to weave. Unfortunately, in the aftermath of war there were few tourists and little market for such handiwork, and the project was abandoned. In the summer of 1952, the Bethany School began receiving groups of Russian pilgrims from Western Europe. These annual pilgrimages, organized and led by Bishop Methodius, had a very positive influence, both on the pilgrims themselves and upon the Orthodox living in the Holy Land. They likewise helped inform the broader Orthodox community of the existence of the Jerusalem convents, eliciting needed financial support. Upon meeting Mother Mary, pilgrims were consistently impressed by her exceptional spirituality and her noble, luminous soul. She was genuinely concerned for the well-being of each individual who approached her, and she showed extraordinary sensitivity in being able to resolve complex and burdensome problems. Warm, gracious and unfailingly tactful, she was loved and respected by a wide spectrum of people. Abbess Mary’s high monastic standards reflected upon the community as a whole. Several of her nuns later became abbesses at other convents. Abbess Elizabeth of the Annunciation Convent in London (six of her nuns there are former pupils of the Bethany School), the late Abbess Tamara, and Abbess Juliana, for many years in Chile and now at the Mount of Olives convent. In 1967, as a result of the Arab-Israeli war, the Bethany community found itself on the territory of Israel. Mother Mary and the sisters staunchly endured the trials that fell to them without retreating from their arena of struggle. But from this time Mother Mary’s physical strength began to decline, her heart weakened. She contemplated retirement, but impelled by the command of love, she remained at her post. Abbess Mary was called to the Lord on 25 October (7 November), 1969. She died peacefully in her sleep, her fingers folded for making the sign of the Cross. News of her repose spread rapidly. That afternoon, hierarchs and clergy of the Greek Orthodox Patriarchate came to the convent and held a memorial service. Then began the Vigil for the departed. Through the night the nuns by turns read the Psalter. The next day, a Saturday, the funeral service was held in a packed church: Abbess Tamara came with nuns from the Mt of Olives convent, as did almost all the Bethany School students; also present were representatives of different church denominations and a large number of other mourners. Afterwards the burial procession filed solemnly up the hill beside the church where, between two pine trees, Abbess Mary’s body was lovingly committed to the earth to await the General Resurrection. Blessed are they whom Thou hast chosen and taken to Thyself, O Lord. Their remembrance shall be from generation to generation. Translated and compiled from materials in the Gethsemane Convent archives. 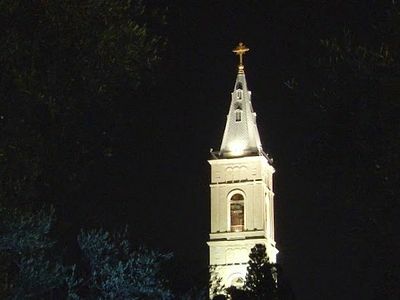 Reconstruction of the bell tower of the Russian Holy Ascension Convent in Jerusalem situated on the very summit of the Mountain of Olives (Mount Olivet) has been completed. Words fail me, I do not know what to say except: Вечнаја Памјат dear sister in Christ!